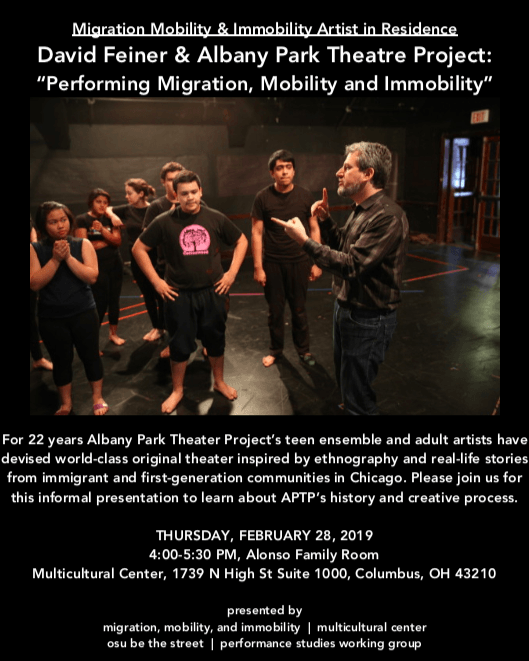 For 22 years the Albany Park Theater Project’s teen ensemble and adult theatre have designed world-class original theatre inspired by ethnography and real-life stories from immigrant and first-generation communities in Chicago. On stage and in community performance workshops, the Albany Park Theater Project challenges inequality and racism by asking people to bear witness to stories that might otherwise get overlooked or misrepresented. APTP performances humanize complex issues like immigration, foreclosure, poverty, abuse, hunger. Audience members emerge from their journeys at APTP with greater respect for the struggles and dreams of others – and with a desire to learn, have genuine dialogue, and take action. 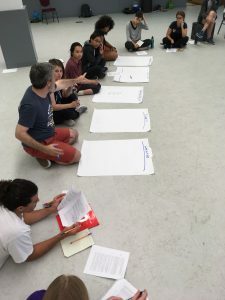 In the process of creating original plays, APTP has joined grassroots organizations throughout Chicago fighting against detentions and deportations, new prisons, foreclosures – and in support of humane immigration policy, investment in neighborhood schools, affordable housing, and more. David Feiner has co-directed, devised, and produced all of Albany Park Theater Project’s nineteen world premieres. With APTP, David’s honors include the Goodman’s August Wilson Award, the Coming Up Taller Award from the President’s Committee on the Arts and Humanities, the Midwest Human Rights Award from National Immigrant Justice Center. In 2016, APTP was named a recipient of the prestigious MacArthur Award for Creative and Effective Institutions. Co-organized by the Migration, Mobility and Immobility Project, Be The Street, and the Performance Studies Working Group. Participants at OSU Be the Street January 2018 APTP Workshop in a game of Yes! Be the Street welcomed Albany Park Theater Project a second time over the Martin Luther King, Jr. holiday weekend. 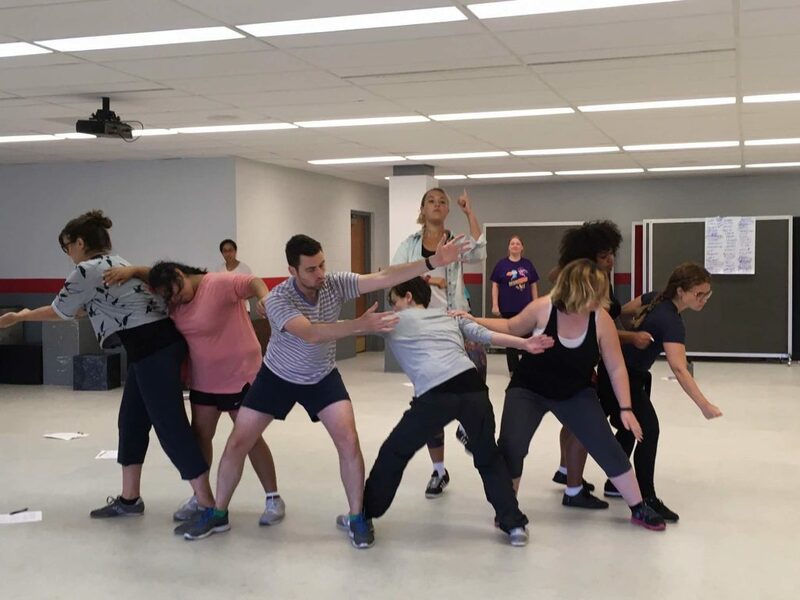 Producing Artistic Director David Feiner, Associate Director Maggie Popadiak, and Resident Director Stephanie Paul guided the core Be the Street team of faculty and graduate students, as well as several newcomers, through exercises in theatrical devising. They were joined by APTP ensemble members Dayana Soto and Ashlie Hankins, and alum Maidenwena Alba, who is in her freshman year at Columbia College in Chicago. 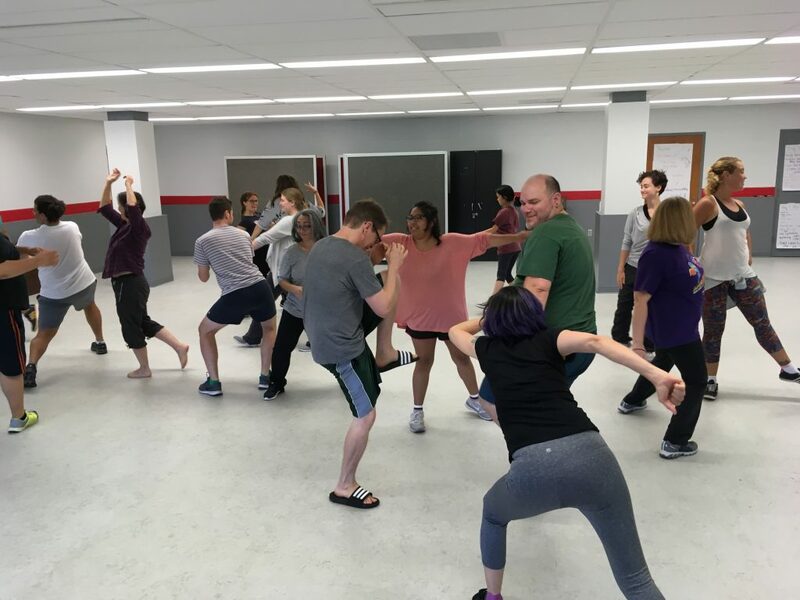 Whereas our August 2017 workshop had focused on using games to build ensemble, this time we focused on using those games and developing other exercises to begin crafting–or devising–scenes. 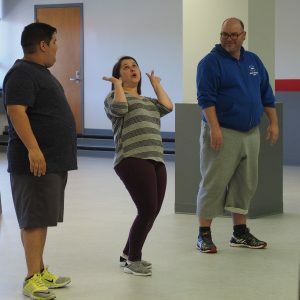 Unlike traditional stage-based theater and dance practices, where performers follow a script or a set choreography, in devising, the members of the ensemble generate the performance material. This process allows the strengths of each participant to shine through. It also enables a more direct and timely response to the issues and concerns facing particular communities. For Be the Street, we are interested in how residents in the Hilltop neighborhood of Columbus, OH make a home for themselves, whether they are long-time community members or more recent arrivals to the area. Monday we spent more time with games that can be done in small groups, like Music & Lyrics, in which some participants read, sing, or recite lyrics to a song (the Internet is a huge help for this), while other participants respond to the lyrics with movement, and Story Fight, a high-octane form of simultaneous story-telling in which pairs face-off and try to outwit their storytelling opponent and get them to stop their own story in order to listen. This game can also be played with a “referee” who tries to listen to both stories as they are simultaneously recounted, and then tries to re-tell both stories. Verbatim and Mind-Meld are also played in pairs. For Verbatim, one person tells a story (our prompt was about a moment when we felt threatened), and their partner shares in the story by trying to both speak the storyteller’s words as they are being spoken, as well as to mirror the storyteller’s gestures and expressions. This exercise requires incredible attention and empathy. Mind-Meld is more light-hearted; after counting themselves in–1, 2, 3–each member of a pair shouts out a word at the same time. This process repeats–count in, offer a word–with each participant trying to verbalize the common ground between their terms until finally both members of the pair shout the same word. This game is as gratifying as it is silly. We also played the death-defying game Hot Chocolate River, in which a group crosses a “bridge” of chairs, with the caveat that each chair must have at least one person on it or it floats away, making the group crossing more and more treacherous. Advanced versions of the game add burdens and tasks such as blindfolding some of the participants, restricting the movements of others (for example by tying their shoes together), or carrying heavy loads. These games were all fun and an important part of the continuous work of building an ensemble, without which devising could not proceed! But the bulk of the workshop focused on giving devisers more tools to work with their ensembles. We especially focused on analyzing transcripts from interviews conducted with Hilltop community members, developing and teaching exercises to support creative exploration, and learning how to structure workshops so that they would build toward a desired outcome. APTP challenged us to consider not only the content (what do you do?) and structure (in what order?) of the workshops, but also the specific people who are in our ensembles (what do they respond to? what do they bring? what boundaries or constraints do we need to anticipate and respect?). Interviews and interview transcripts provide the foundation for APTP’s own creative process, and we spent a lot of our time together pouring over interviews conducted by Be the Street faculty in anticipation of this workshop. Such interviews support devising by offering concrete details of people’s experiences, providing a rich layer of descriptive detail to work with rather than generalizations. In analyzing these transcripts, we pulled out themes that emerged, images the speakers evoked, and turns of phrase or uses of language that caught our attention. We also assessed the theatrical opportunities and challenges in each transcript, which led to important conversations about how to represent experiences ethically. David reminded us that at APTP, they aren’t engaged in documentary theater; they aren’t looking to portray people’s stories as they were told. Instead, they aim to recreate how they felt when they heard these stories, and to share that feeling with audiences. We are very much looking forward to our final workshop in March!! An interview transcript broken down and analyzed during the OSU Be the Street January 2018 APTP Workshop. 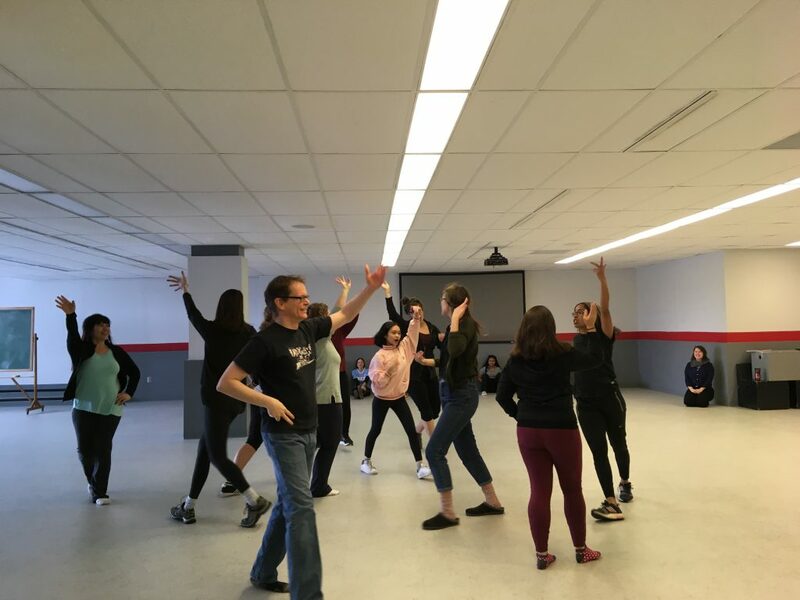 As described in an earlier post, the first half of Be the Street’s intensive workshop with Albany Park Theater Project focused on building an ensemble from students and faculty across the Arts and Humanities at OSU. The second half of the intensive focused more explicitly on crafting performance from real-life stories through a combination of ethnographic interview and theatrical devising. Short-form devising based on self-exploration bridged these two halves. Small exercises designed to plumb our own personal histories generated material for group exploration. Exposing ourselves to scrutiny in this way was a crucial step toward the challenge of imagining and incorporating the life experiences of others, but equally crucial was the support of the ensemble we had built. In small groups, we related stories from when we were young. We collectively decided which stories to enact, thus inviting group members into our stories and their telling. Individually, we built “life graphs,” which chronicled significant people, places, and events in our lives, and then we animated these by creating a sequence of movement that reflected images or metaphors we associated with key moments in our lives. These sequences were shared in groups of various sizes and in spaces of various sizes. The smaller the groups became and the more constricted the space, the more the performers interacted with each other and their life stories became intertwined. 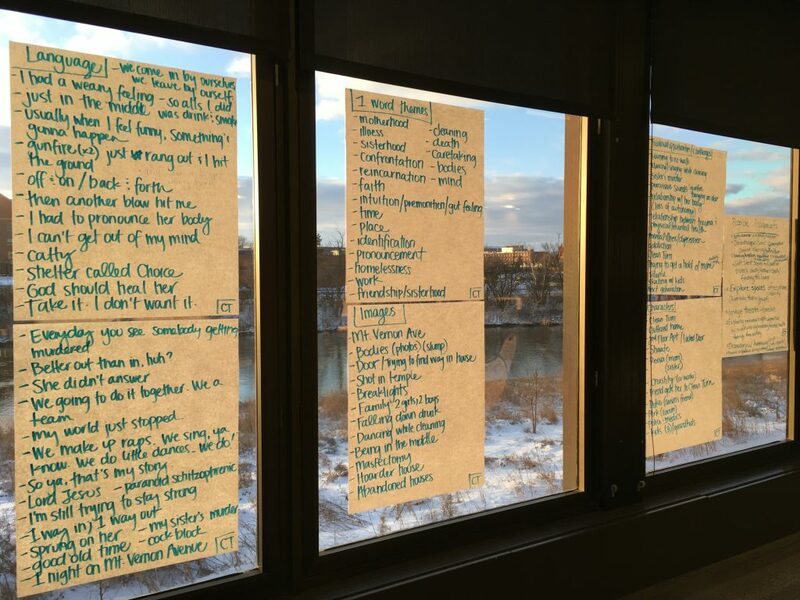 The techniques explored individually and in small groups served as building blocks for long-form devising on the basis of other people’s life stories. 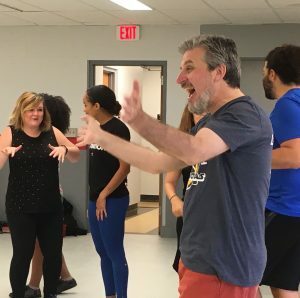 David Feiner, Producing Artistic Director for Albany Park Theater Project, provided an interview that was part of a recent performance project. “Josephina,” as the woman was called, recounted her experience of running away from home and crossing the U.S.-Mexico border at a young age, and her current struggle to keep her husband from being deported while sustaining her children financially and emotionally. Reverse-engineering the interview, we applied the same techniques we had previously used on our own stories to enter into Josephina’s account. We identified themes, key people, and a chronology of events. APTP Directors David Feiner, Maggie Popadiak, and Stephanie Paul added a few more layers as we worked with the interview: the image wheel, where we each responded to themes from the interview by shaping ourselves into static sculptures, machines, which brought such sculptures together and added elements of movement and sound, and sleep talking. Machines, so-called because of their component human parts working together, were a particularly powerful way to explore themes from Josephina’s story as a group. Each machine began with a single person responding to an idea, and embodying that idea with repeating movement and sound. For example, we built a machine based on Time, since much of Josephina’s story centered on feeling like time was both the enemy and the unknown. One person provided an opening gesture, and, one-by-one, others joined in while many stood as witnesses to the unfolding drama. Like the ‘I Come From’ Orchestra, machines require that each participant examine what precedes their entry and how their addition complements and contributes to the exploration. Once a group has congealed, a director can modulate the group’s energy, volume, and speed for further exploration, or individuals can break off to form new machines. As we had done with our own life graphs, we also animated Josephina’s life graph, working in groups to depict key moments and metaphors from the interview. Later, we added a layer of text, using snippets of Josephina’s own evocative prose to allow our compositions to register on visual, auditory, and kinesthetic planes simultaneously. An important question arose as we grappled with bringing Josephina’s story into our bodies through movement, and as we used her words and images to build little worlds from her interview text: What was our obligation to Josephina, to her experience, to her story and her self-narration in this process of devising performance? What right did we have to tell her story? Feiner reiterated that theirs is not documentary theater, so there isn’t a question of performing biography or of representing stories exactly as they are told. When community members consent to be interviewed by members of the APTP ensemble, it is with the understanding that their stories function as inspiration for a larger production that weaves many stories and perspectives together. This approach contributes to anonymizing interview subjects, many of whom are likely to be from vulnerable populations, and it allows one character to become a vehicle for many people’s stories. Those who offer their stories to the process will continue to recognize themselves in the resulting work, but because there is no longer a story that belongs to a single person alone, each scene becomes a story of the community—everyone has a stake in the story and its outcome. Feiner offered another way to work through the sticky appropriative implications of building performances from other people’s stories. In theatrical training, it is not uncommon to mine one’s own experiences to identify with a character and bring life to that character through determining their motivations or psychology. In method acting, one tries further to become the character—to merge oneself with the person one is portraying. But for APTP, portraying a character as such misses the point. Although performers may share backgrounds or experiences with characters the ensemble collectively creates, they do not attempt to own or co-opt other people’s experiences in pursuit of “authenticity” in their performances. Instead, in embodying and enacting someone’s story, they try to capture how the story made them feel, and to recreate that feeling for an audience. The goal is not to portray a real person by telling their story, but to conjure a feeling. This offers an alternate route for empathic identification that summons compassion for those whose experiences neither performers nor audience members may share, but of which we might never otherwise know. Acknowledging the emotional difficulty of much of this work, we concluded the intensive with more games: Cabana Pesoa, Monster, Colombian Hypnosis (from Augusto Boal), I’m an Expert, and Randy’s Dance Party (named for a former APTP ensemble member). Humor and play are as important to the process of devising as are the techniques of interview analysis, character development, and movement and text generation. Be the Street thanks Albany Park Theater Project for the generosity with which they have shared their process. We’ve had such a wonderful time, and we look forward to round two in January!! The first day of the Albany Park Theater Project opened with the requisite introductions, but with a twist. Instead of asking workshop participants (about 20 in all) to say their names and something about themselves, APTP’s Producing Artistic Director David Feiner asked everyone to introduce themselves by telling the story of how they got their names. This prompt resulted in stories about family origins, cultural practices, and serendipitous encounters as participants represented the larger contexts in which they were given (or chose) a name. Feiner talked through the work that Albany Park Theater Project does as a youth ensemble committed to social justice. “We devise original performance from people’s real life stories,” he said, noting that in order to devise performance in this way, their group conducts extensive ethnographic research. Before performers can weave a theatrical experience from life stories, however, they first have to build an ensemble. The ensemble is the foundation for all the work that follows, so the first two days of the workshop were focused on creating this sense of community across disciplines and fields of study. 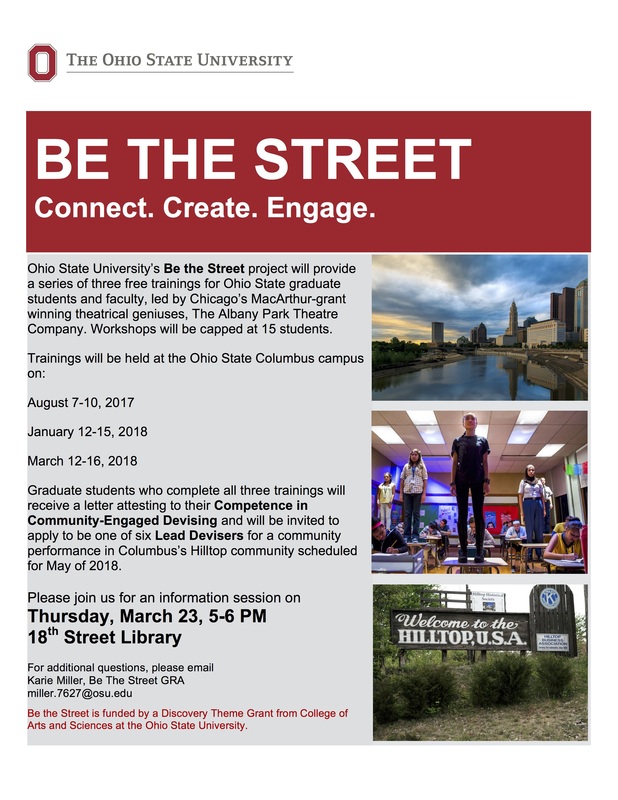 Be the Street pulls together Ohio State faculty and students from across the College of Arts and Sciences, including Theater, Dance, Comparative Studies, and Spanish and Portuguese. “Being human is interdisciplinary,” Feiner said on the first day, and so is Be the Street. We all bring different skills, experiences, and expectations into the room, but the approaches that APTP shared give us a common vocabulary to work with. Games are a central component of how APTP builds the trust, teamwork, self-exploration, and joy that supports ensemble. Games like Splat! and Bop! cultivate focus and require fast-thinking. Mingle-mingle, Yes!, body percussion exercises, and ‘I Come From’ Orchestra create a sense of a community as consisting of both wholes and parts. 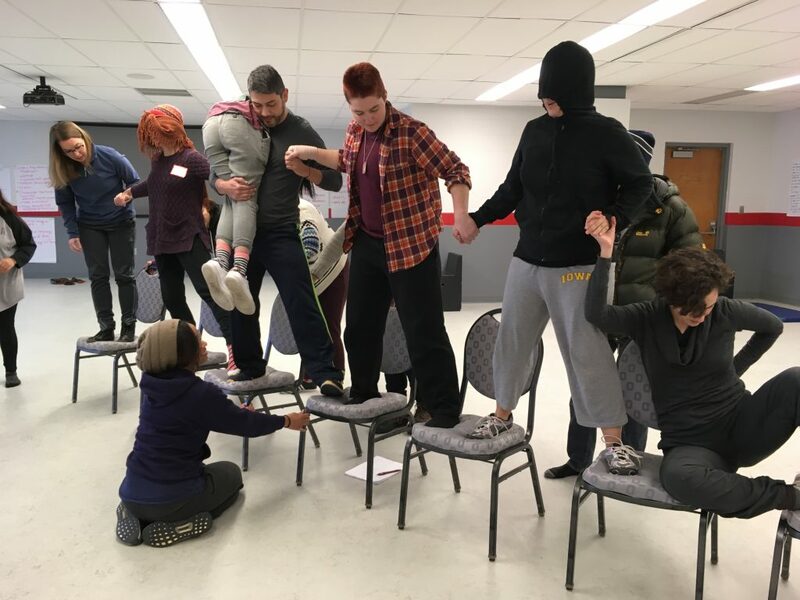 Cross the Line and When I was Young—an entree into what APTP calls short-form devising—and Life Graph center on how participants author their own lives and experiences. Handshake Sculptures, Mirroring, See and Be Seen, and Hands required both trust and care as vulnerability and power became a focus. 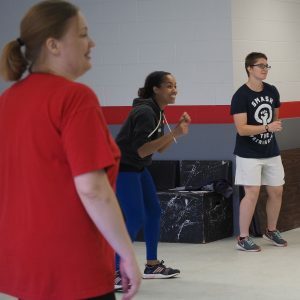 Other exercises, such as the daily warm-ups led by Resident Director Stephanie Paul or the Follow Your Mama Like a Baby Penguin exercise, fostered ensemble through what one participant called “shared embarrassment.” Indeed, these games contained multiple objectives. For example, following a leader in their movement choices until the group energy crescendos to a collectively shouted YES! encourages sensitivity and awareness of what other people are doing and one’s relationship to that person and their actions. Perhaps just as important, everybody looks ridiculous doing it. But if everyone commits to that ridiculousness, that collective action quickly generates something amazing from the unique contributions of each individual. Such was the case with the ‘I Come From’ Orchestra. Gathered in a circle, APTP’s Associate Director Maggie Popadiak led the group in an exercise that began with simple statements about where they come from, and culminated in a wondrous cacophony that included everyone’s voices (and their silences) in a sound composition. Eyes closed, responding to the idea of home, participants evaluated the evolving sounds in the room before adding their voices to the mix one by one. Both repetitive and building, this exercise offered a layered illustration of society itself as co-composition, and sowed the seeds for later devising. The ensemble members, Carlos De Santiago, Maidenwena Alba, Ashlie Hankins, and Dayana Soto paved the way for workshop participants. Though teenagers, they proved confident demonstrators for the exercises and assured participants, some many years their seniors, that they had our back. The APTP directors gave us the instructions for the games and exercises, but it was the ensemble members who really gave us permission to tackle them—in spite of looking silly, in spite of feeling uncomfortable, in spite of confusion or uncertainty. They offered sure-footed guidance, showing the way forward while remaining committed to the process of learning by doing. 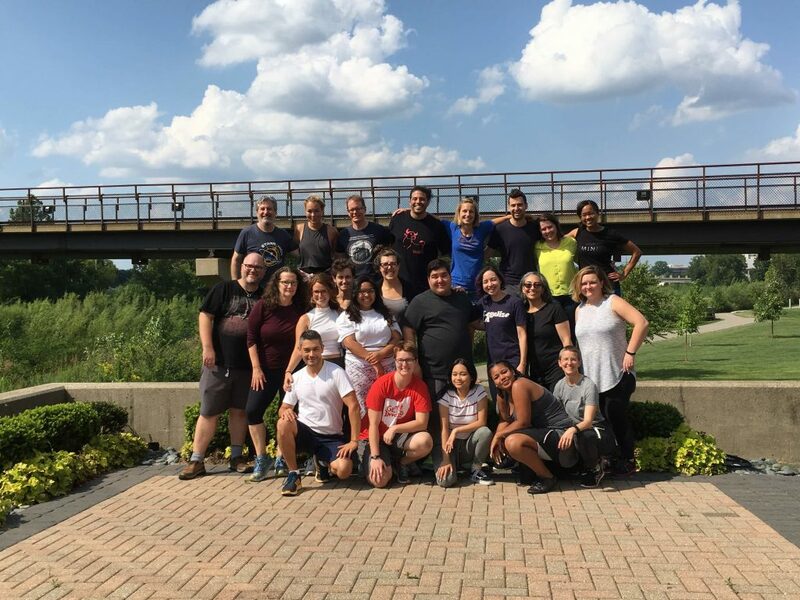 Be the Street is delighted to welcome the Albany Park Theater Project to OSU this week, where they will be leading a group of faculty and graduate students from across the Arts and Sciences in a training intensive on devising community-engaged performance. 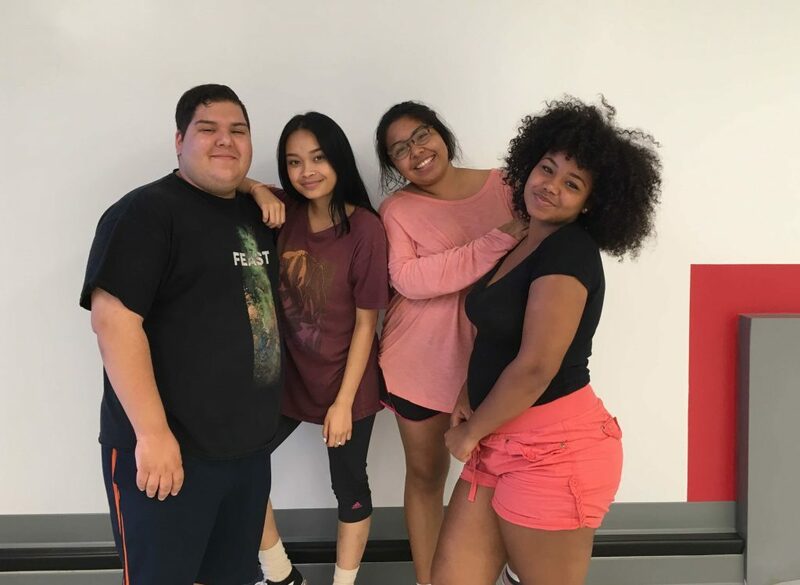 Based in Chicago, APTP is “a multiethnic, youth theater ensemble that inspires people to envision a more just and beautiful world.” They have a three-pronged mission that includes a dedication to art, youth, and social justice. APTP is theater with a purpose. They create original performance works drawing from the lived experiences of participants in order to give voice to communities that otherwise have little access to the means of their own representation, including immigrants, working class Americans, and urban teens. Audiences are called upon to witness these stories, engage in dialogue, and take action in their communities. We look forward to spending an enriching week with APTP in the first of three intensives that will be held throughout the academic year.